Before the month gets away, time for a quick look back to the best changes to downtown in 2018. The list starts with the restoration of the Marist College. The sorry “before” facade. Tarps covered holes in the walls. The Marist College was built in 1915 as a boys school. One of the largest mud adobes in the state, it was in total disrepair for the past 15 years. Gaping holes appeared at the top of several walls, and it appeared that the whole thing might collapse. Now it is apartments and a community space for low-income seniors. The Marist apartments and another 75 new apartments to its north — at the corner of Broadway and Church — were developed by the Foundation for Senior Living using $19.6 million in federal low-income tax credits. Rio Nuevo, also using tax dollars, contributed $350,000 for renovation of the Marist and another $1 million to improve the pedestrian streetscape on Ochoa, which is the street in front of the Marist. The Marist and its sister apartment building are part of what’s called Cathedral Square — between Church and Stone avenues. The new building shown above will house offices for the Diocese of Tucson and a conference center for the adjacent San Augustine Cathedral. In the spirit of this being a post about “bests,” I will say that this new behemoth has a lovely cornice. And as best I know, this project is funded by the Catholic church, not taxpayers. The Monier, a project that started right at the end of the year, will fill this big hole in the Mercado district with underground parking, retail on the ground floor and apartments in four stories above that. I am putting this on the “best” list because it is a sister project to the Mercado San Agustin Annex, which opened last summer across the street. The Annex is a collection of old shipping containers that are now locally-owned retail, food and drink establishments. In this Amazon-world, it’s nice to have local. Plus, the Annex itself is a sister project to the wonderful Mercado San Agustin. You know you are in Tucson when you’re at the Mercado. The architecture, the courtyard, the shops, the food and the drink all ooze a sense of place. The Mercado district is west of Interstate 10 on the south side of Congress Street. Tucsonans and tourists line up for the food at Seis and the pastries at La Estrella. The “100” addition to Hotel Congress sign is my favorite small downtown improvement of 2018. Few local businesses are older than the Congress, which has been owned by Shana and Richard Oseran since 1985. Their vision and hard work started the boom on the east end of downtown. Go big and brag; you’ve earned it. This is one piece of the mural “Split Screen” painted last fall by Amir H. Fallah on the side of the Museum of Contemporary Art, 265 S. Church. It positively glows in the late afternoon light. The spikes and the colors belong to the Sonoran Desert. The photo above does no justice to the restoration of what I will always call the Wig-O-Rama/Grill block on Congress Street. There’s delightful brick detailing from top to bottom — all newly exposed from beneath cracking stucco. So many new buildings are charmless, cheap boxes. This block of East Congress is a throwback to when owners were willing to pay extra to dress up their buildings for public display. 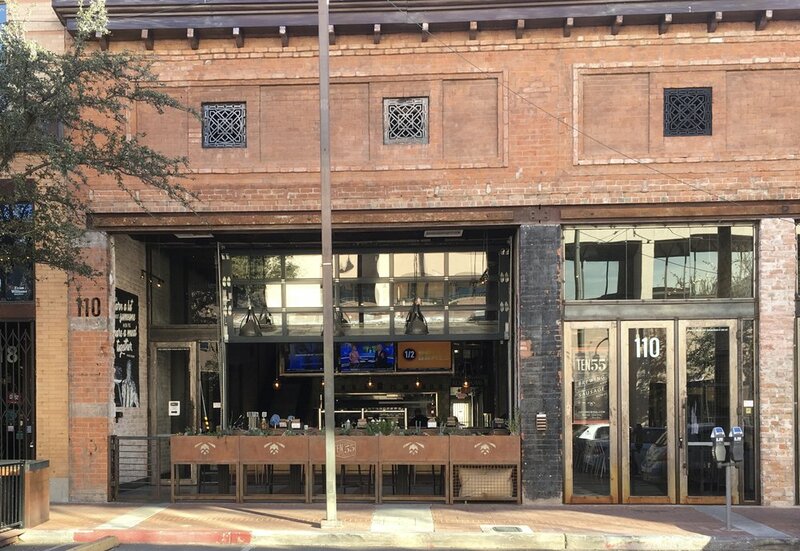 Ten55, shown here, specializes in beer and sausage, which do not delight the author of True Tucson. However, people — in the royal sense of “people,” have told me the carne and cerveza are good. The renovation of the Brady Court apartments, just south of the Temple of Music and Art on Scott Avenue, is the True Tucson 2018 residential favorite. They were built in 1915 and were apartments until a previous owner decided to demolish them. They were saved in 1976 by a new owner who turned them into offices. And, then again, they gradually fell into disrepair. Now, thankfully, they are apartments once again. What makes them special are the front porches and the courtyard. That space looks a bit stark right now, but it will be lovely when the trees get bigger. The runner-up for a favorite 2018 residential project is the newly completed 18th Street Bungalows in Armory Park. These four homes are clearly new, but they fit right into the Armory Park Historic District thanks to their rooflines and front porches.